Furbys are adorable and a bit obnoxious, but could they be used as fluffy little spies? The National Security Agency once banned the electronic toys because it feared that they would listen in on classified conversations. In 1999, after the Furby craze put tons of these talking toys beneath American Christmas trees, the NSA issued a memo banning them from its offices in Fort Meade. Because the commercials advertised Furbies as "learning" English over time, the folks in charge believed that Furbies contained an internal recording device, and they feared the toys would spill secrets in their cutesy voices. According to a 1999 BBC News article, anyone who came across a Furby on NSA premises was instructed to "contact their Staff Security Office for guidance." However, the NSA's intelligence on Furbies was a bit off. 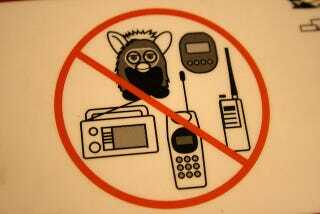 The Furby came preprogrammed with words in English and "Furbish," and couldn't actually record or playback anything. Tiger Electronics president Roger Shiffman ended up issuing a statement assuring the intelligence agency that "Furby is not a spy!" Image credit: Eli Duke, from Qantas Airlines, which presumably banned Furbies because they could talk, not because they might listen.